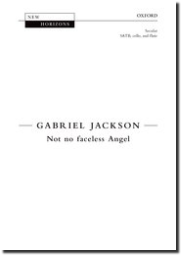 Not no faceless Angel is a beautifully reflective work. Originally commissioned by Joy Hill and the RCM Junior Department, the work is a sensitive setting of words by Tanya Lake. The themes of loss and love are articulated through expressive melodic lines and touching imagery. A recording by Polyphony and Stephen Layton is available on Hyperion CDA67708.